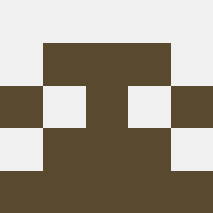 The default GitHub avatar is a 5x5-pixel image. A color is picked randomly, and then random pixels are filled in on one side (right or left, 2x5 size) using that color. Then that side is copied & flipped to the other side, across the y-axis. 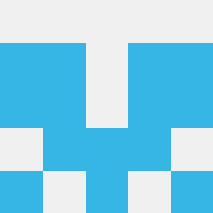 The pixels left over that are not filled in are #F0F0F0, or rgb(240,240,240). The center column's pixels (1x5 size) are then randomly filled in, using the same color as previously. Obviously doesn't work online, but you can have it print color codes here. This is non-competing as it only has a 256 colour palette, only works on terminals that support ANSI escape codes and doesn't actually output a 5 pixel square image, but I thought I'd post it anyway as it was fun golfing this down. Note: the \e is actually ASCII char \x1B. Use $- to automatically round the colour number for use in the escape sequence, used instead of $n=0|rand 254. This saves the result in file a.png. % on (0,1). This is the foreground color. 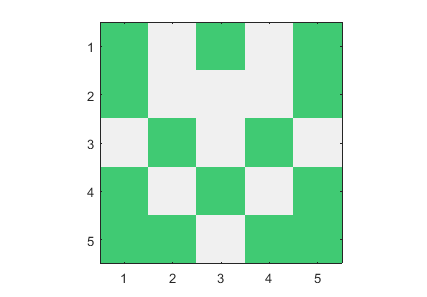 % 5×5 array become the random foreground color. Zeros remain as zeros. print "P3 5 5 255"
I'm at WWDC and just got the Xcode 8 beta with Swift 3. Apple made some of the CoreGraphics calls more "Swifty," and I am able to reduce the bytecount. This answer assumes UIKit is available and uses the Cocoa Touch framework. I know I can't compete with most of the other answers but I wanted to give this a shot as a personal challenge. There is definitely room for improvement with this answer, but I think it will be hard to get this down below a few hundred bytes due to the length of the UIKit and CoreGraphics image writing method names. I opted to write an actual PNG file rather than PPM values as an exercise for myself, but shorter answers would definitely be possible if I used the PPM format. I already start out as a loss by having to declare a variable to seed srand48 with time. I chose this over arc4random() or arc4random_uniform() because ultimately I would lose more bytes with those. I seed the rng to use drand48 to generate a random color and pick when to write a color to a pixel. I would have to create CGFloats x and y due to the nature of the for loop. I'm really not thrilled with the 2D loop and if equality checks, but I was really struggling to find a shorter way. There's definitely room to shave off a few bytes here. Calling CGContextFillRects with an array of CGRect structs is cheaper than calling CGContextFillRect twice with two different values, so I save a few bytes with the array and pointer. I also save 27 bytes by not calling UIGraphicsEndImageContext(). While this would normally be a "bug" in production code, it's not necessary for this toy program. Colors are also a pain to deal with, since I'm creating UIColor objects but need to write a CGColor opaque type to each pixel. The shortest code I found to create a random color was to use the UIColor constructor and get the CGColor from that UIColor. Same with white. If I were using the Cocoa framework instead of Cocoa Touch, I might be able to save some bytes using CGColorGetConstantColor(), but unfortunately that method is unavailable in the Cocoa Touch SDK. Definitely open to further optimizations. Edit 1: Saved a few bytes by rearranging some variable declarations.  is the Transpose operator. produces a png image called 'output.png'. Here the results of some executions of this code. I know this is an old challenge but I just like to challenge myself. // Set a pixel of a random color for current coordinate. If it exists in the array, use the array value. Note: does not produce a file, draws to a canvas. See it in action in this JS Fiddle. Not the answer you're looking for? Browse other questions tagged code-golf graphical-output random or ask your own question.